Do you color your hair? Do you use color protecting shampoo? There is science in hair coloring, chemicals and measuring, and although it is a transforming process, it can also be very damaging to your hair. It can be difficult to keep up and extend the color. You paid to get your hair done professionally, so it is important to make sure that you do what you can in order to maintain the look. There are ways to ensure that your hair looks and stays healthy after coloring, from the best color protecting shampooto water temperature and heat protectant spray, here are some ways to protect your colored hair. When you color your hair the cuticle layer is opened, allowing color to attach to the ahair shaft. If you wash your hair too quickly after a hair appointment, the layer could potentially still be open, leading to your newly applied color to wash off. It is recommended to wait a full 72 hours after your dying session to shampoo your hair. This will ensure that your cuticle layer is closed and you do not wash all of your color down the drain. There are also amazing color protecting shampoos than can keep your hair vibrant and refreshed. It’s crazy to think that the temperature of the water could affect your colored hair. Most people enjoy nice long hot showers after a long day, but that isn’t so great for your color. If you are using hot water to wash your hair, that opens the hair cuticle and could potentially wash out the color. In order to protect your dyed hair, it is recommended to use warm water while shampooing and conditioning your hair. This will ensure that your color does not fade. If you are not washing your hair as frequently, your color is more likely to stay vibrant, because each time you wash your hair, you will likely wash out some of the color. 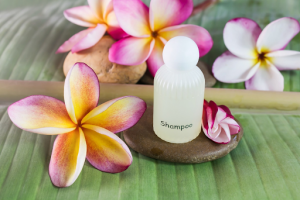 The natural oils that moisturize your hair and keep it looking fresh, but if it gets too oily, you can use a dry shampoo on the off days. It is recommended to wash your hair every other day or two to three times per week. When you use heated tools to style your hair, like curling irons or flat irons, it can damage your hair and even strip the color off of your hair. In order to keep your hair safe while using hot tools, make sure you prep your hair with a heat protectant spray that will keep your hair safe while you blow dry or style. Whether your use the best color protecting shampoo or wash your hair less per week, make sure you are doing your best to keep your hair safe and vibrant after coloring it.